Big businesses may have an advantage because of their existing brand awareness and their larger marketing budgets, but that doesn’t mean small businesses and startups can’t compete with them. In some ways, smaller companies have an unfair advantage when it comes to design because their sites and apps don’t have to be so bloated. Provide your customers with a straightforward, intuitive, attractive experience on your website, and they’ll be happy to become repeat customers. A website or app’s ability to bring in repeat business relies on whether people understand and appreciate it. “Am I getting value from this? Is it user-friendly? Is it fun?” These questions form the basis of a prospective customer’s decision as to whether they will become regular users of that site or app, or will never come back. That’s where User Experience (UX) and User Interface (UI) design come into play. User Experience is the way a person interacts with and uses a product, system or service. User Interface is closer to what we consider visual design. If you think of UI design as the tool you consume a bowl of cereal with – a spoon – UX design is the overall experience of pouring the cereal into a bowl and using your well-designed spoon to eat it. 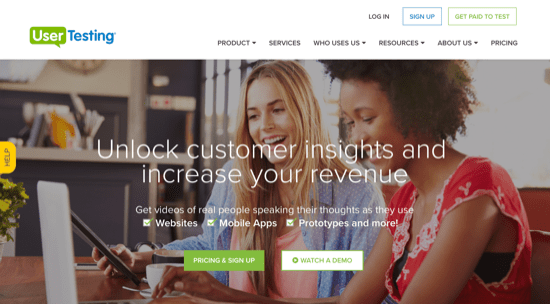 You can create a web and app experience that is useful, pleasing, and impactful – but you have to understand how UX and UI can help you and optimize each to improve the experience for your customers and prospects. Knowing the difference between UX and UI design and how to best use each creates a significant competitive advantage for your business, and just like good customer service, is thoughtful, effective, and hugely impactful on the lasting success of your brand. According to Time News, 55% of web users spend fewer than 15 seconds on a website. This means that you have 15 seconds to get a person’s attention, clearly demonstrate the services you offer, and illustrate why your company is worth their time. the attention span of a human adult, according to BBC News, is 9 seconds (the Associated Press reports that in 2012, the average attention span for a human was 8 seconds). Nearly one fifth of all page views in 2012 lasted fewer than four seconds. And to add fuel to the fire, people read only approximately half of the words on a web page that has fewer than 111 words (and only 28% of the words on a web page that has more than 593 words). Because you have a small window of opportunity to reach your customers, you have to capitalize on any chance you have to shape their experience into a great one. That’s where User Experience design (UX) comes into play. Good businesses and good user experiences share some of the same core principles: be useful, be usable, and be enjoyable. This means that you’re already familiar with what to consider when building the UX end of your digital experience. In one study, 51% of people thought a useful element often missing from websites was thorough contact information. Talk to your customer service or tech support team, as they are often the first line of contact for your customers. Find the most common issues and questions that people have, and then address those. You can also set up social media keyword alerts to “listen in” on what customers and prospects are saying about your company or products. There’s nothing like hearing what customers say to other people about your business to give you a direction or a focus point. It’s important to make sure you are organizing your site and its flow of information properly. Having a well organized, easy to use, and appealing website better engages your customers, which ultimately increases your conversion rate. That means more business for you! Make your product’s usability top notch, and you’ll be sure to create a significant impact on your bottom line. Can customers easily remember how to use it? How does it handle things if something goes wrong? How satisfying is it to use? How can you be sure that your product is usable? Test it with your customers. Get them to use the product while talking through what they find easy and challenging. You can also hire consultants who specialize in usability testing or use dedicated sites like usertesting.com, trymyui.com, or userzoom.com to gather feedback. 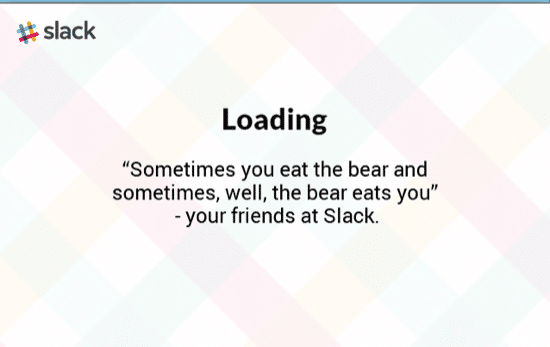 Slack uses humor and surprise to make what would normally be a boring experience (like waiting for an app to launch) into something fun and delightful. Author Arthur C. Clarke once said, “Any sufficiently advanced technology is indistinguishable from magic.” Adding that magic by creating an enjoyable experience is what elevates a product from being adequate to something truly great. Products that make us smile will keep us coming back for more, and by adding that little something extra you can make using your design a memorable one. Photojojo incorporates whimsical elements like this subscribe button to inject some personality into their website. Photojojo is “the most fun photography gear store on the web.” Their website is full of fun little flourishes, from the whimsical “subscribe” button for their newsletter (the self-proclaimed “best newsletter you’ll read all week”), right down to the jaunty animations they’ve added to some of their product images. The site is still very usable and clean, but the humor and playfulness of Photojojo’s brand come through clearly. Anticipating your customer’s needs is another excellent way of adding delight to your products. Amazon has made anticipating its customers’ needs an art. In addition to its uncannily useful “customers who bought this also bought” suggestions, Amazon thoughtfully resurfaces items you’ve looked at in the past and makes it very easy to come back where you left off, no matter what device you were on. Delightful User Experience design gives life to your product. It creates an opportunity to express the personality of your brand through the use of humor, animation, thoughtfulness, and personalized experiences. If User Experience design is all about how something is used, User Interface (UI) design is the method that makes that experience possible. It’s the graphic design that pulls your eye through a magazine article, the controls that make it easy to apply filters to your photos in Instagram, or the toolbar in your email client that gives you quick access to replying, forwarding, and composing an email. Effective UI design should not only be beautiful and elegant, it should also be simple, consistent, and timeless. 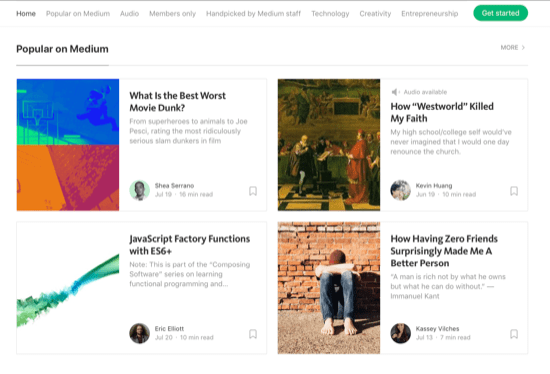 Medium’s layout is very clean and simple, making the words on the page the primary element. Creating an effective interface for your product means stripping away unnecessary elements. You don’t want to throw roadblocks in front of your customers that prevent them from achieving their goals (like buying a product, asking for more information, or registering for an account). Google research found that people consistently rated simple websites as more beautiful than visually complex ones. Another study from Harvard and the Universities of Maryland and Colorado found similar results: the more visually complex a website was, the lower its visual appeal. The bottom line? The simpler the design, the better. Simple, clean designs have a number of other benefits, as well. They help make the information you want to present easier to access. They are easier to learn and navigate. They are often easier to develop and load faster. Netflix maintains a very consistent design and tone across all of their apps. Creating a consistent UI will make your product easier to use and more visually appealing. Consistent designs are less frustrating, less confusing, and save time for everyone. Using the same colors and designs for interface items like buttons and links makes it easier for people to learn your product. You can also use your company’s existing color palette or official font, further solidifying your brand. This is where creating a style or branding guide can really help. Create a strong visual hierarchy that makes important things larger than less important ones. Use the same spacing and margins for layouts. Ensure there is visual and aesthetic consistency between all of your products to give your customers a unified experience that is distinctly your brand’s. UI design, like all design, goes through cycles and fads – what was popular five years ago might look out of place now. A well-known example is the evolution of the UI for Apple’s iPhone. 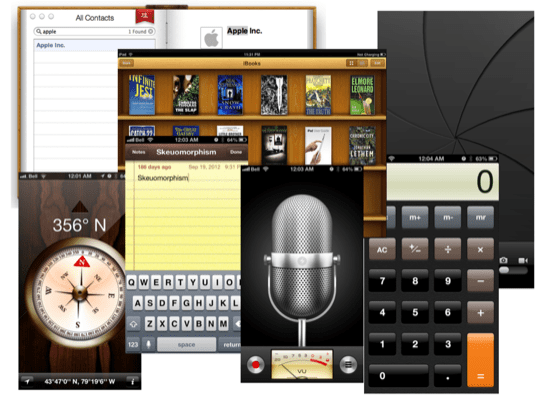 In 2007, to help users learn how to use its new gesture-based interface, Apple took cues from the real world: the Contacts app looked like a real address book, buttons looked three-dimensional and realistic, and apps like the notes and compass apps looked similar to their real world counterparts. But with 2013’s release of iOS 7, Apple completely overhauled the interface, getting rid of these real world cues for a flat, sparse looking design. Overnight, apps that used real world visual cues went from fitting in with the operating system to looking dated. Websites imitating the iPhone’s look and feel not only looked out of date, they also looked out of place on mobile devices running different operating systems. It’s important that your products look current and modern, but try to make sure any design elements you use are as time-tested as possible. That way, you can avoid having to update once the trends inevitably move on. One study found the overall aesthetics of a website contributed 75% to its credibility. Another found that 94% of first impressions are design-related. A third found a whopping 88% of online consumers would be less likely to return to a website after a bad experience. We are convinced that good design can materially help make a good product reach its full potential. Good design is good business. The culture-shifting successes of design-oriented businesses like Apple, Starbucks, and Target prove him right. All of these companies not only have robust design cultures – they also invest heavily in User Experience and Interface design. 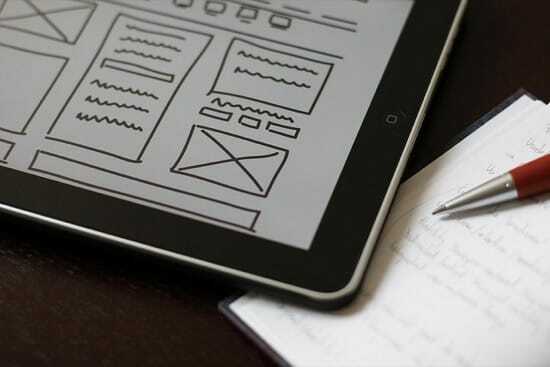 UX and UI design are integral parts of your brand’s online presence. Having thoughtful, accessible design in both your visual and experiential identity will help your company compete in the increasingly online-oriented business world. Knowing the difference between UX and UI is a great start. Knowing how to employ them to your greatest advantage is what will really set you apart, and the talented web and mobile app designers at crowdSPRING can help you do exactly that. If you’re ready to invest in your website or app’s design, crowdSPRING can help you get started. Engage with crowdSPRING’s community of over 200,000 designers who can work with you to move your company’s design to the next level for as little as $299.